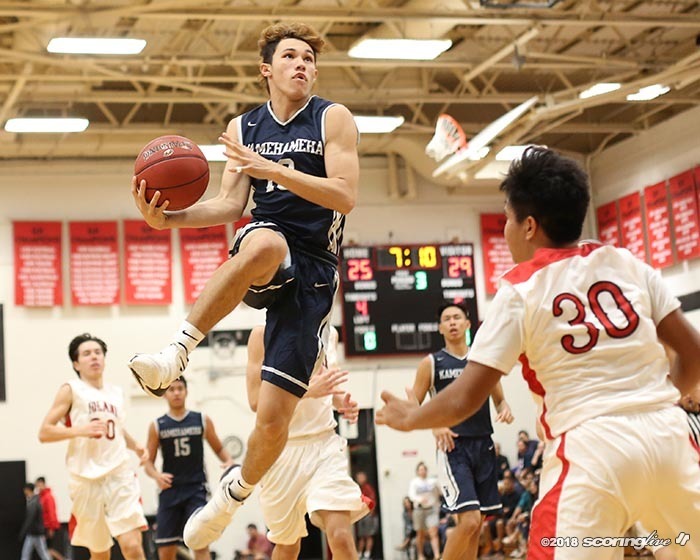 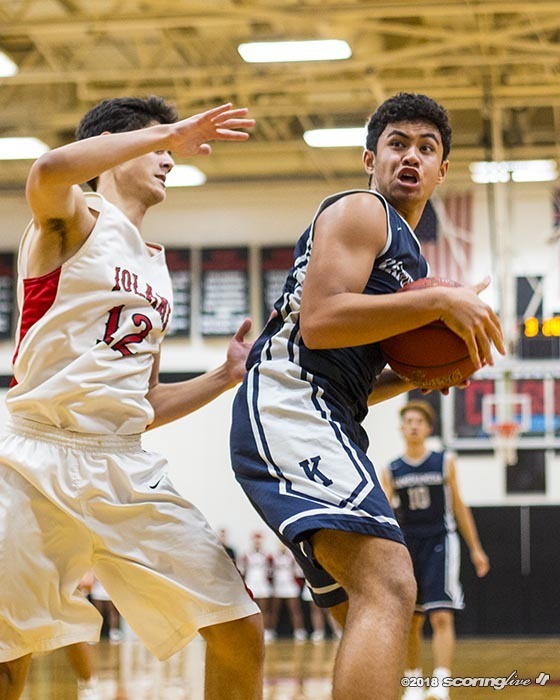 Kobe Young scored 23 points and Kamren Victorino-Kato added 16 to help second-ranked Kamehameha upend No. 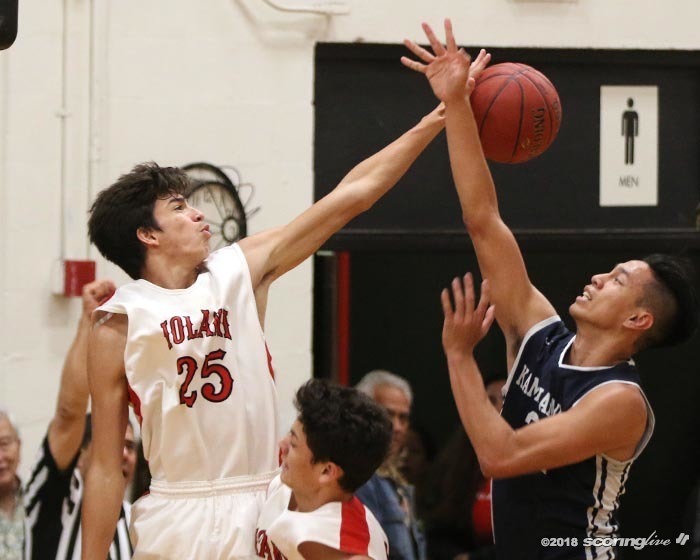 5 Iolani, 58-49 in an Interscholastic League of Honolulu Division I matchup at Iolani's Lower Gymnasium on Saturday. 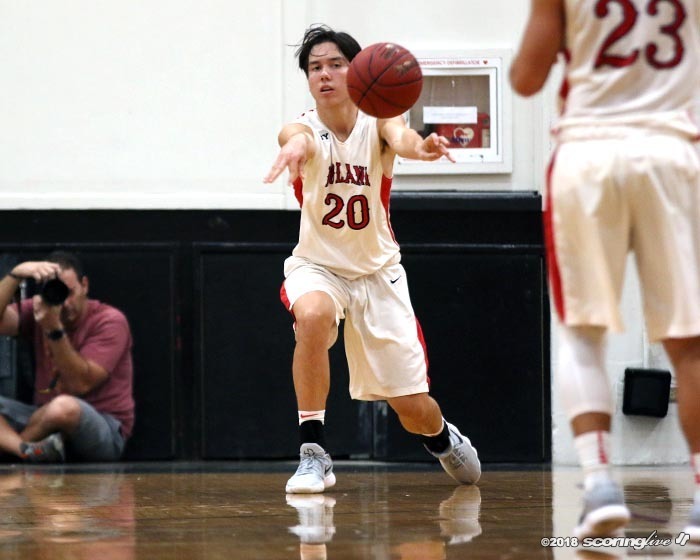 "Just getting any win no matter who it is, we can't take days off. 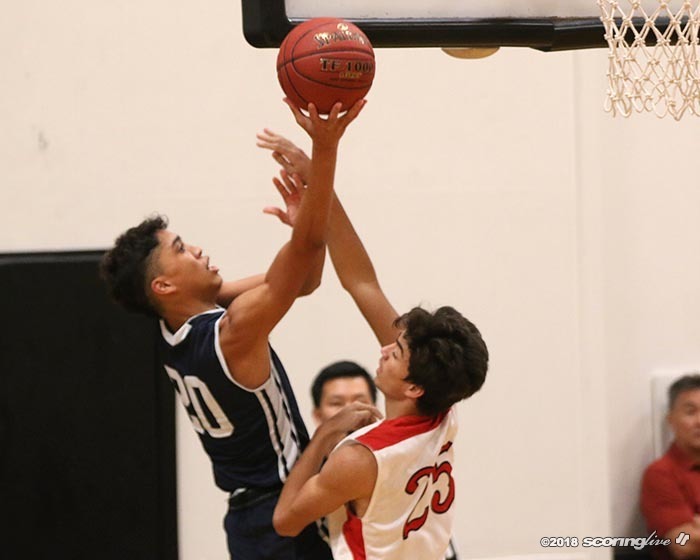 We did what we had to do," said Young. 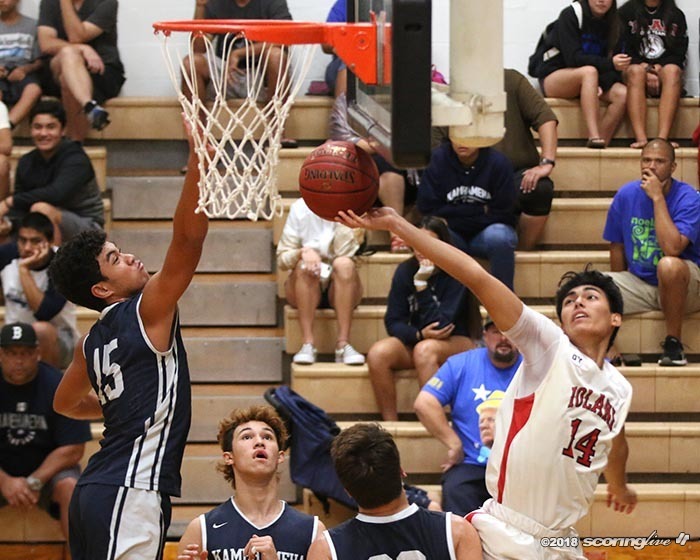 The Warriors improve to 2-0 in the ILH standings and beat the Raiders in the preseason, 47-30 to win the Kailua Surfrider Classic back on Dec. 2. 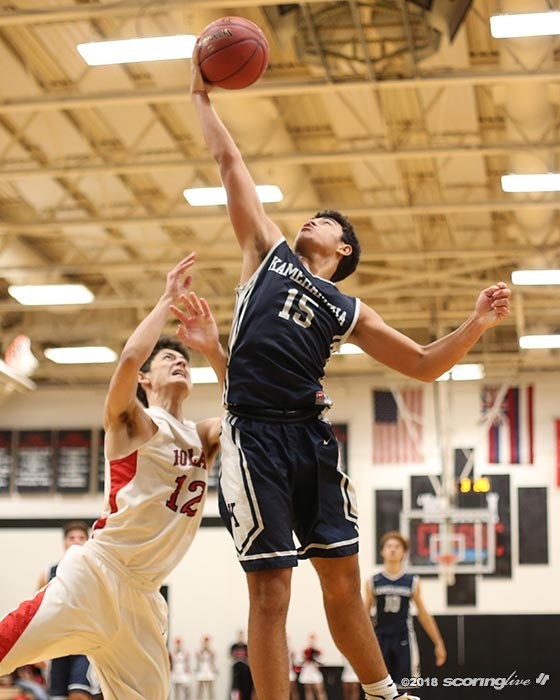 Kamehameha heads to Hemmeter Fieldhouse to take on top-ranked Punahou (2-0 ILH) in a battle of unbeaten teams on Tuesday, Jan. 9. 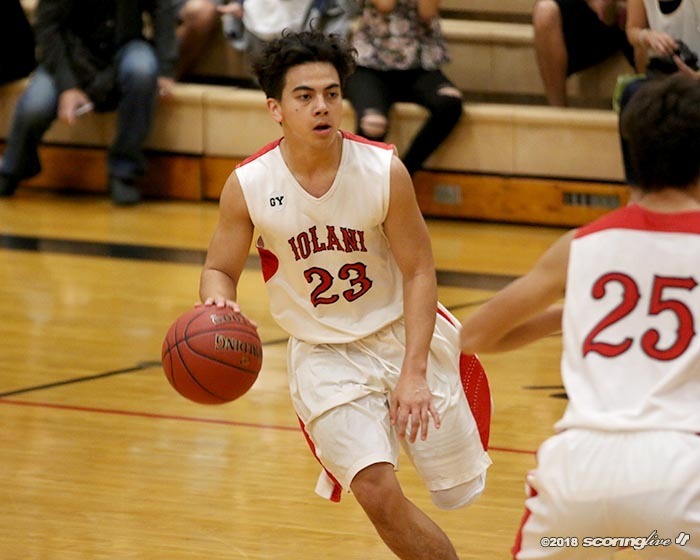 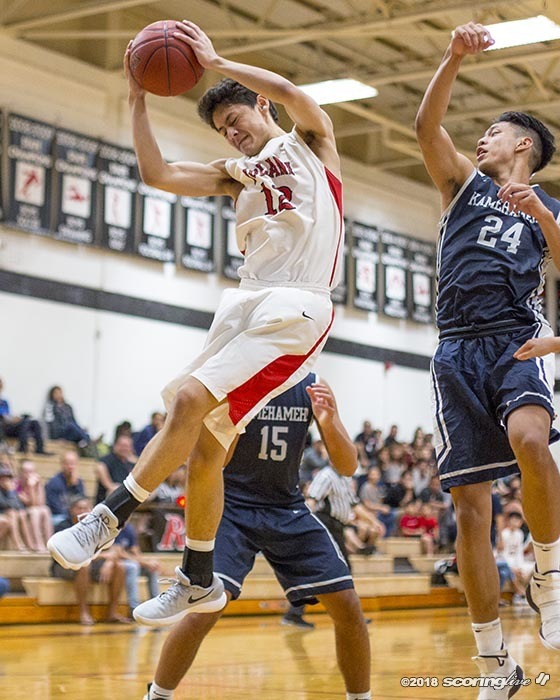 Iolani fell to Mid-Pacific (1-1 ILH) on opening night on Thursday and dropped to 0-2 in league standings. 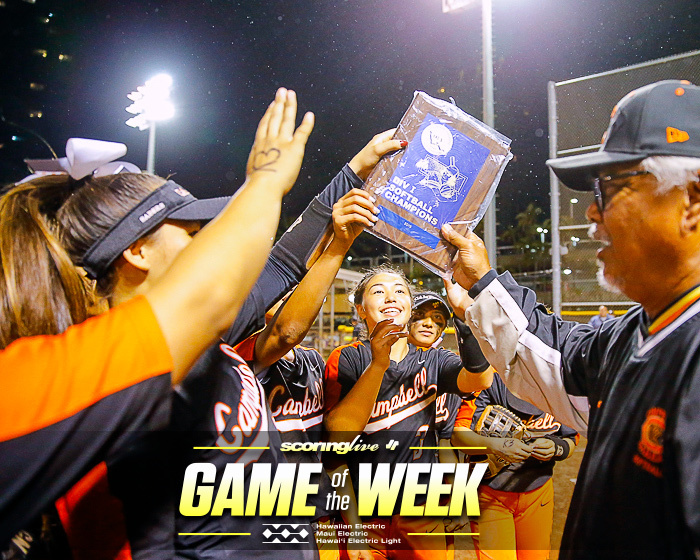 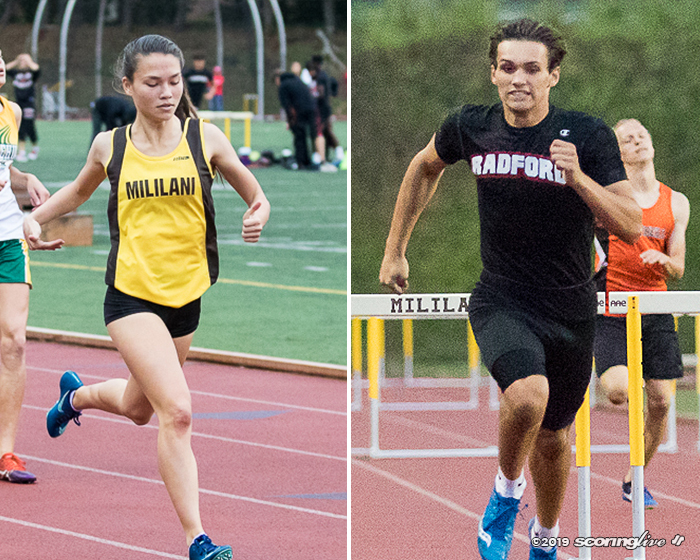 The Raiders seek their first league win and plays winless Saint Louis (0-2 ILH) on the same night. 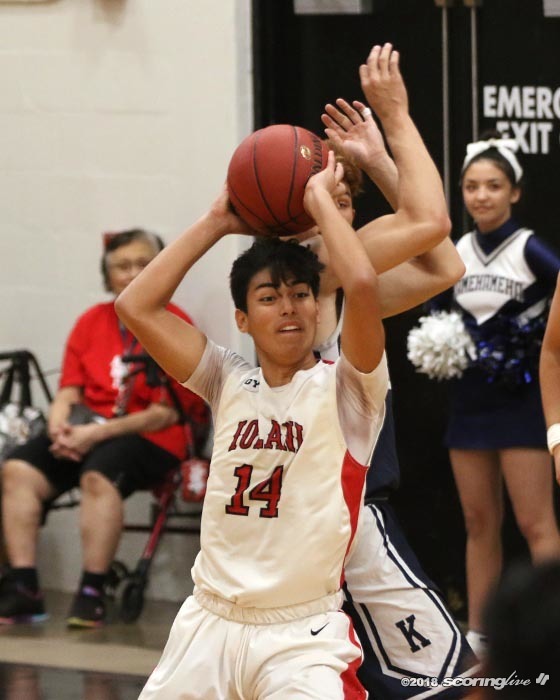 Young asserted himself in the second and third quarters scoring 18 of his 23 pints and shot 8 of 10 overall from the free throw line. 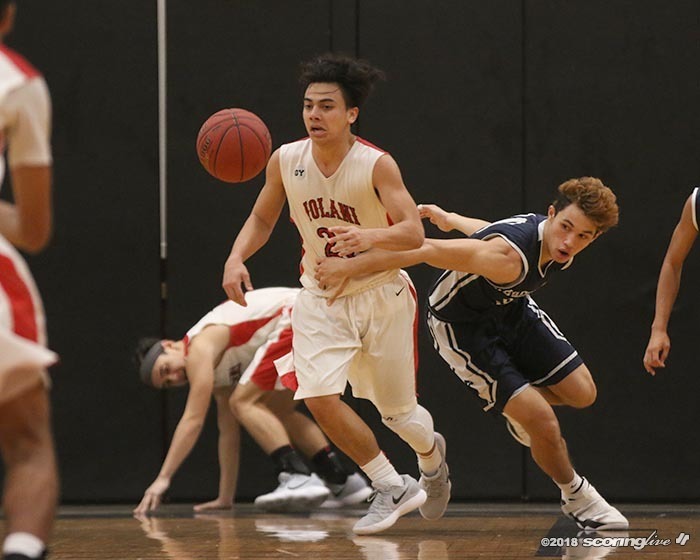 "Cole (Hogland) was missing so I took advantage of the inside presence. 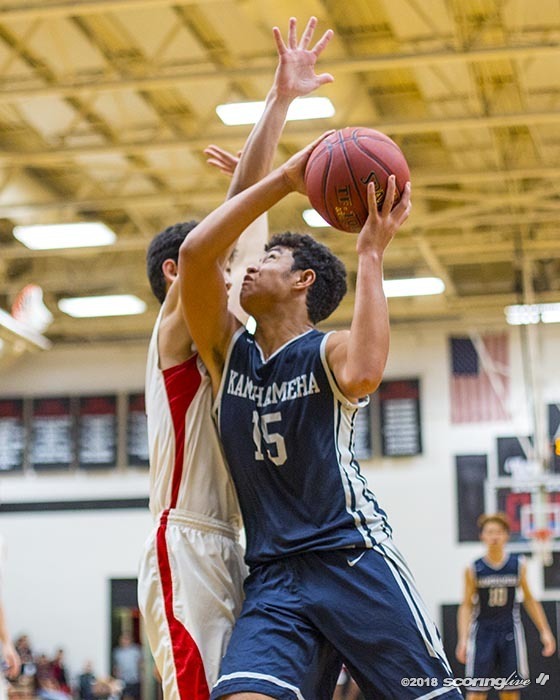 I went inside and outside, that's my game depending on who's guarding me. 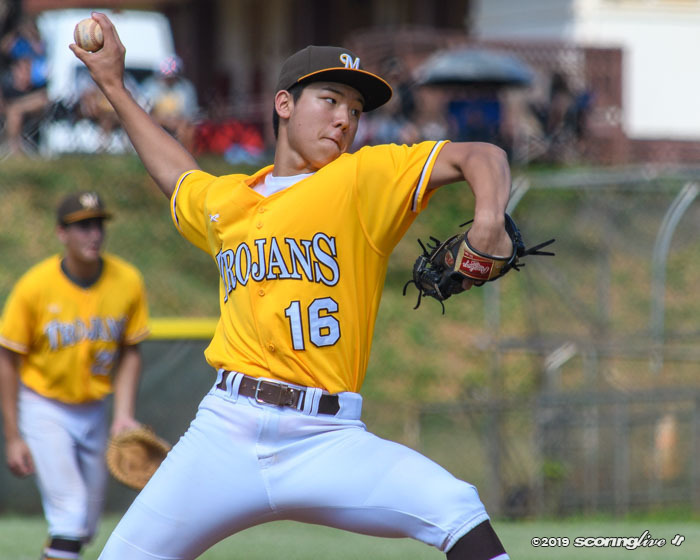 I took the looks that I needed," said Young. 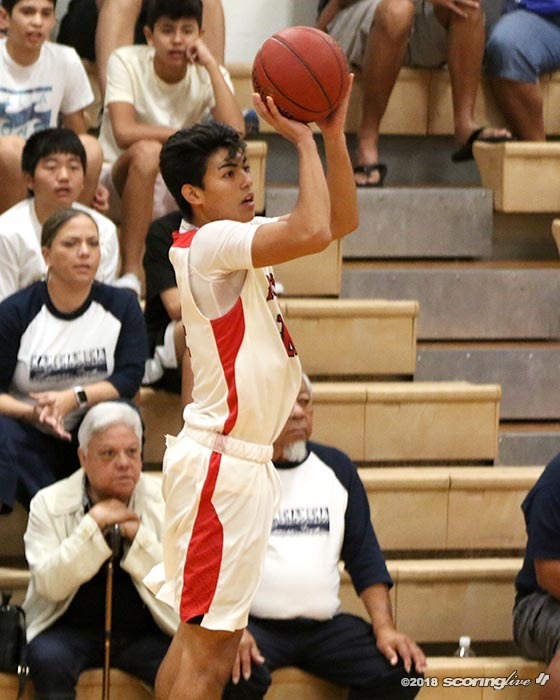 Victorino-Kato attacked the basket to score nine of his 16 in the first half and finished 6-of-10 shooting from the field and 4 of 7 from the charity stripe. 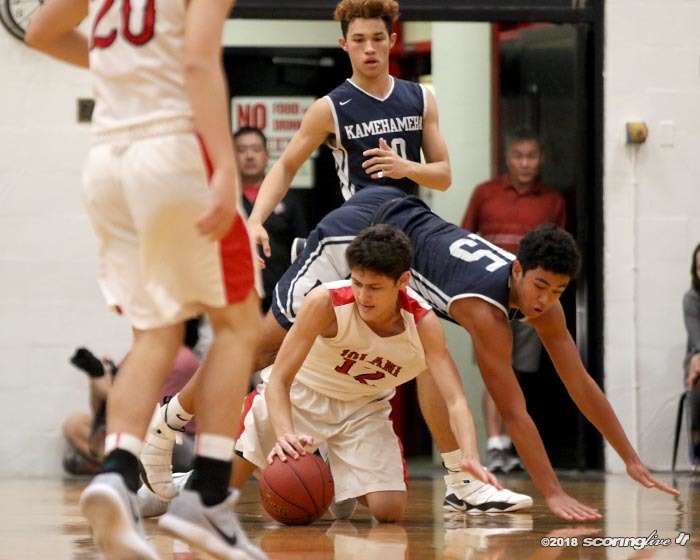 "We get that consistency. 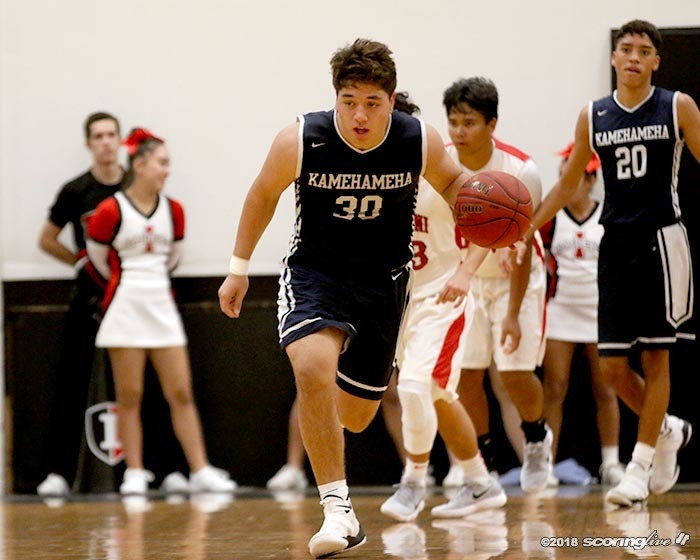 Kamren doesn't always mean points, but it's his threat with his speed and what he does with the basketball. 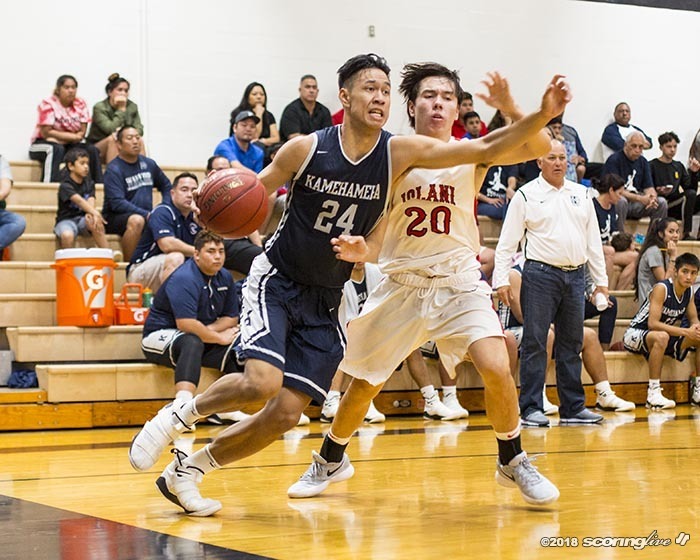 Kobe has been off the charts and he's going to give you his full effort on defense," said Kamehameha coach Greg Tacon, on his dynamic duo. 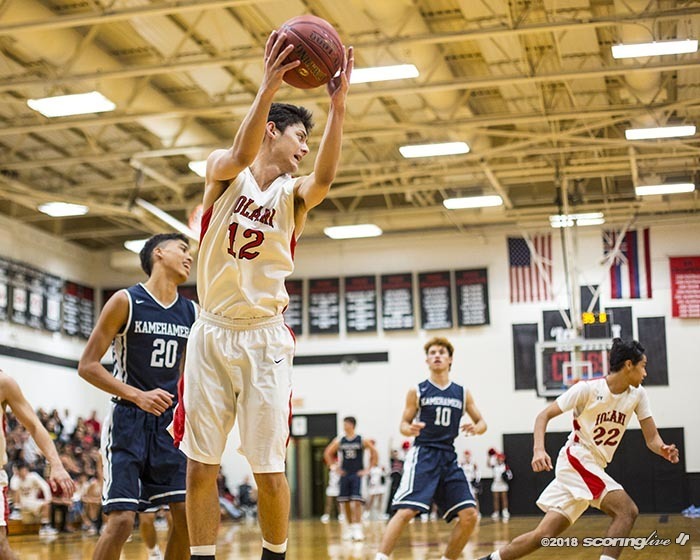 Iolani tweaked its starting line up and later platooned five players to provide a spark. 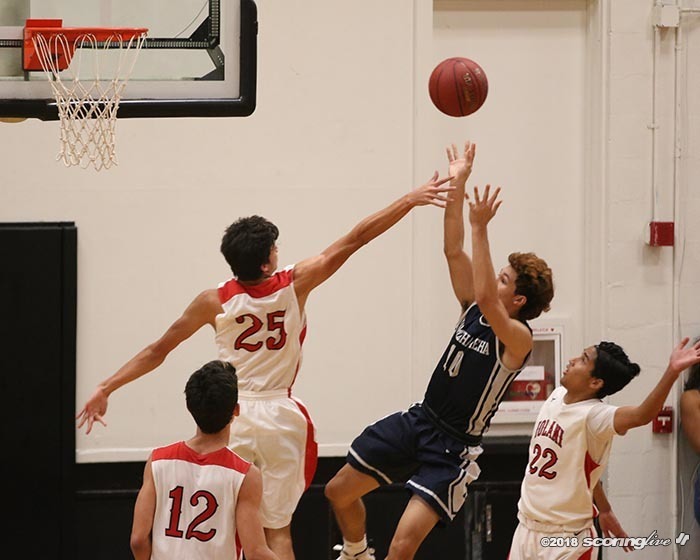 The Raiders got 17 points from the bench, nine coming from Cole Kadoguchi, who drained three 3's and Justin Genovia added two more as the Raiders held a 17-13 lead. 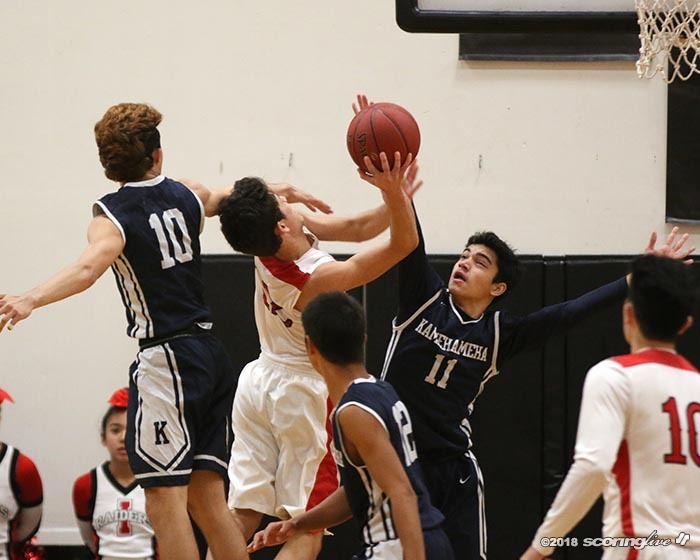 "I think his (Kadoguchi) first two were wide open and Geno's (Justin Genovia), I thought we were kind of near him. 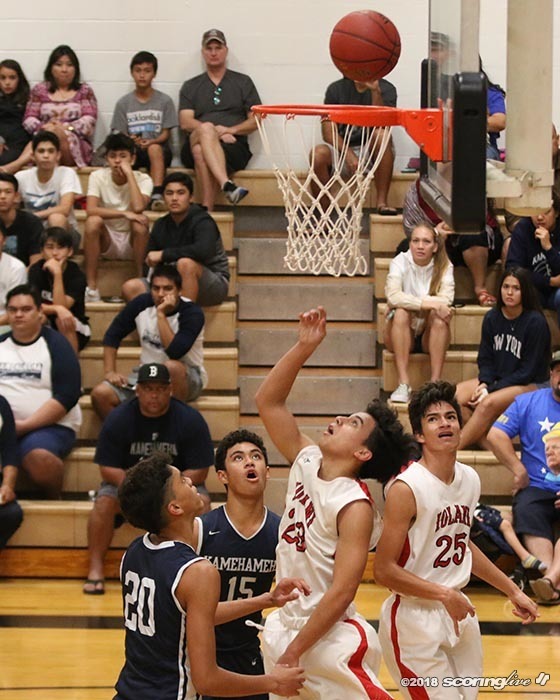 They got hot and that was a big part of the first quarter and that's why we had a deficit. 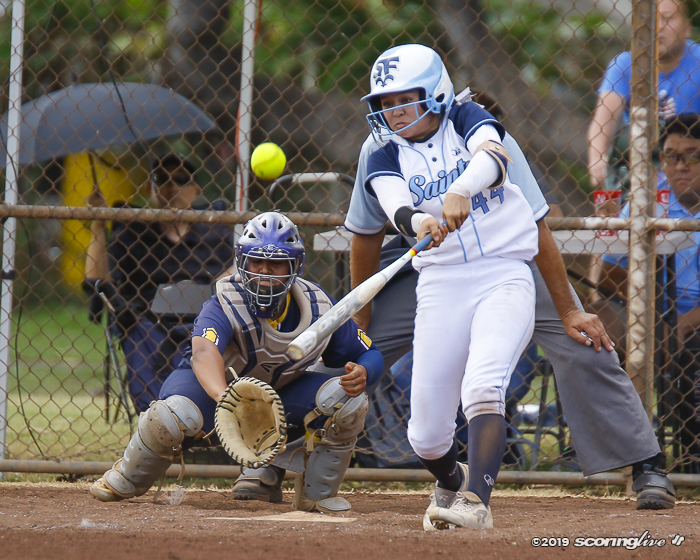 We kept chipping away," said Tacon. 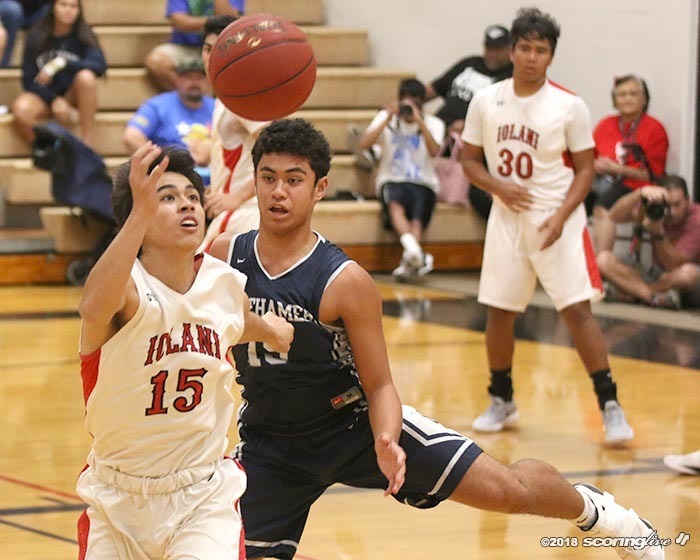 Iolani shot 5 of 7 from the 3-point line in the opening stanza, but it wasn't sustainable as it finished 7 of 26 overall. 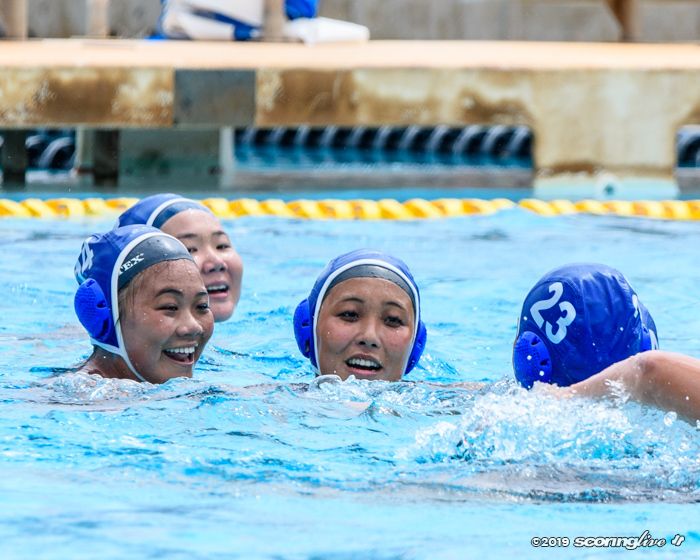 "I'm proud of my kids. 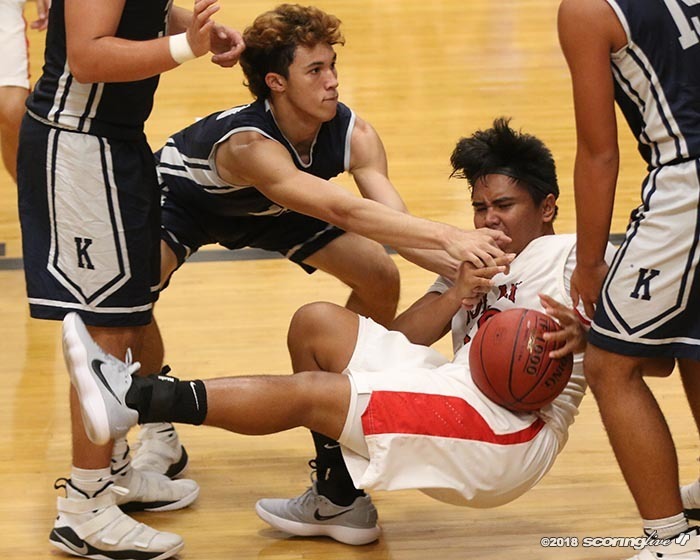 When a team comes out and knock jumpers on their heads like that, it's easy to put your head down and get disappointed. 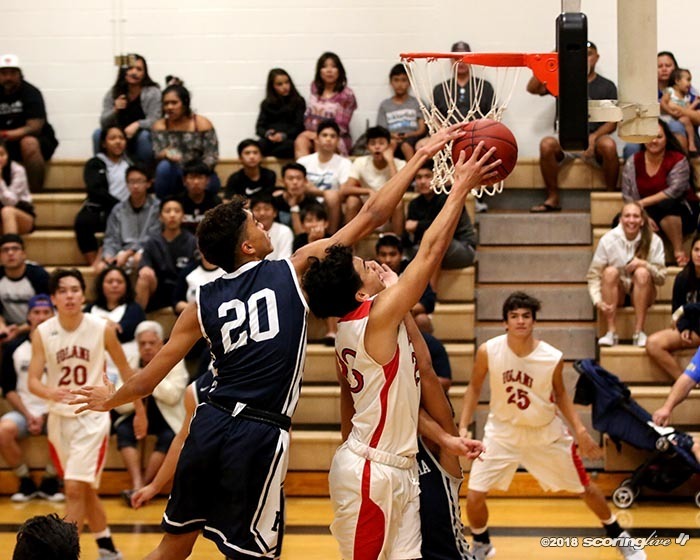 But we hung in there and weathered the storm," said Tacon. 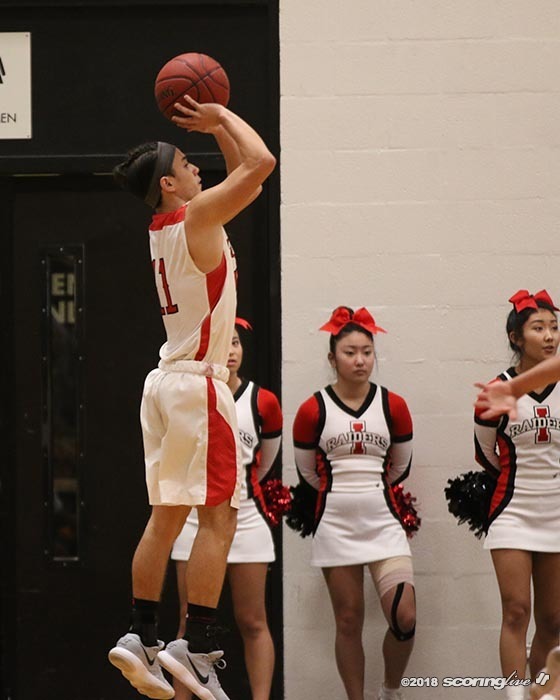 The Raiders took a six point lead off of Ryan Van Cantfort's shot plus the foul, but he missed the free throw to make it, 19-13. 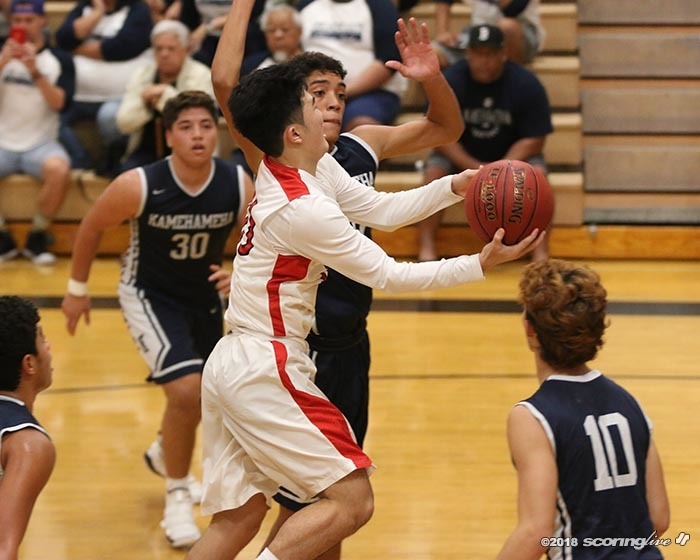 The Warriors chopped the deficit down to one, following a pair of Victorino-Kato free throws and Young added two more to reclaim the lead, 24-23 and never trailed the remainder of the game. 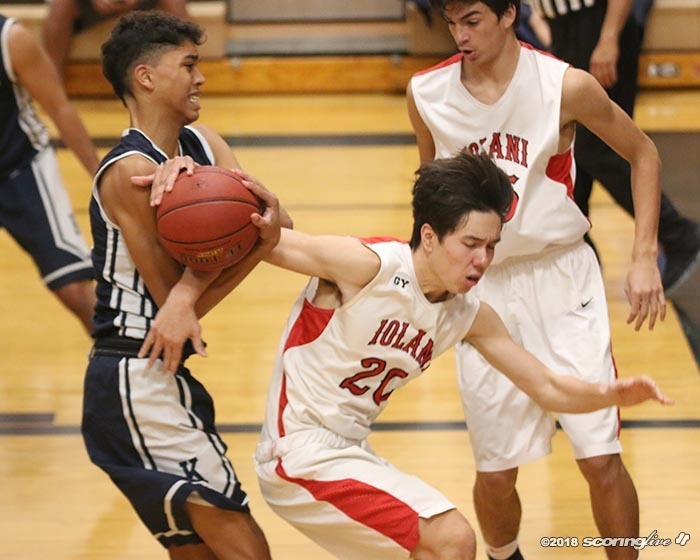 "I thought they were doing things different defensively than they normally do. 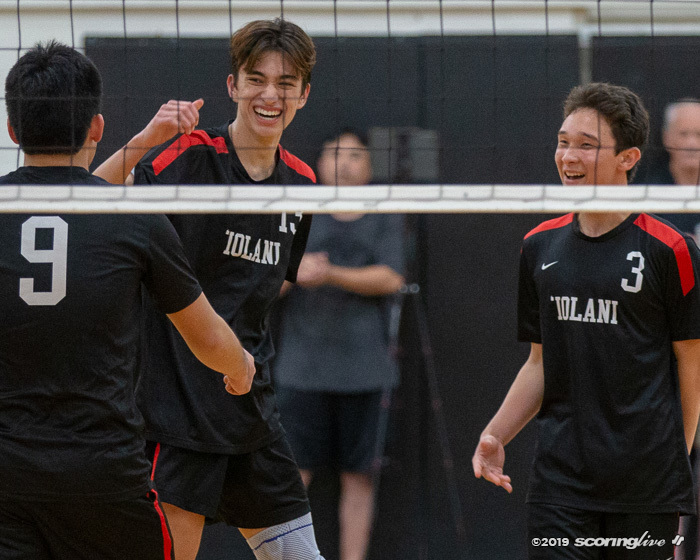 We had to adjust offensively and try to get some more quick-hitting action and not just rely on our sets that require screens," said Tacon. 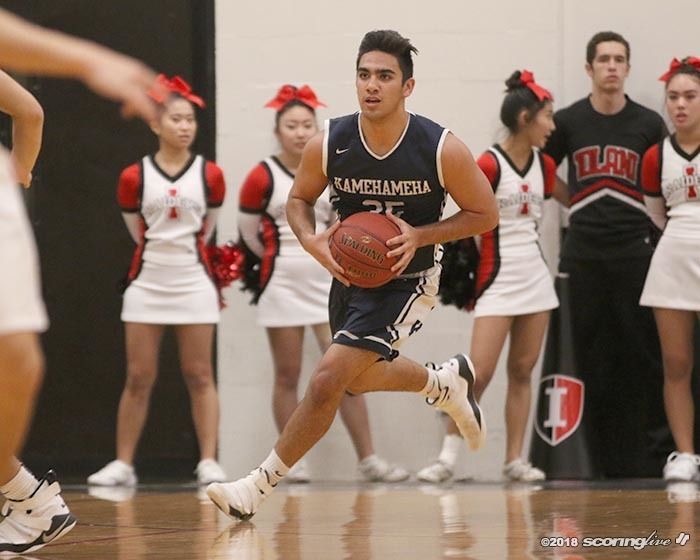 Kamehameha led 29-25 at halftime. 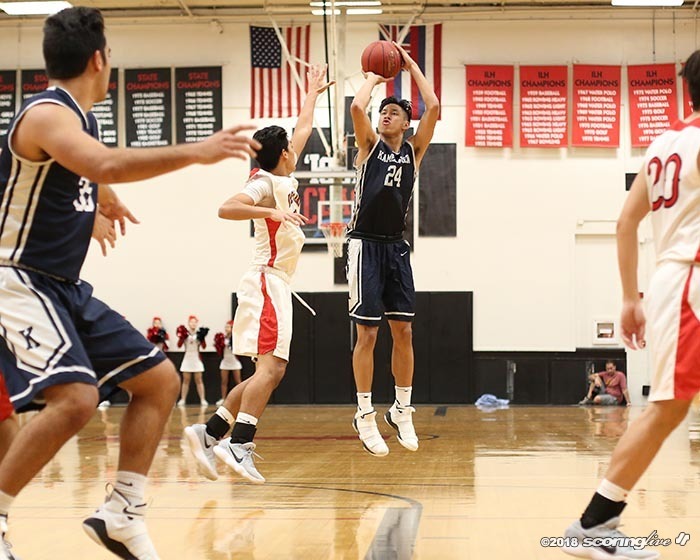 The Warriors as a team shot 18 of 24 from the free throw line and shot 9 of 12 in the first half. 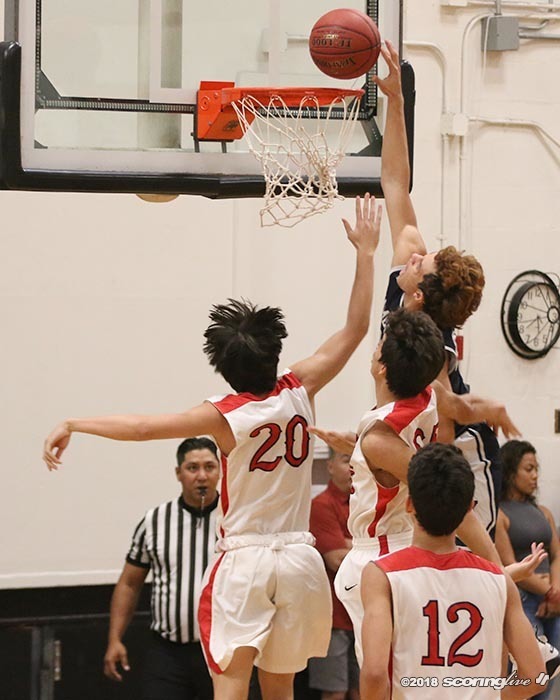 The Raiders shot 10 of 19 overall. 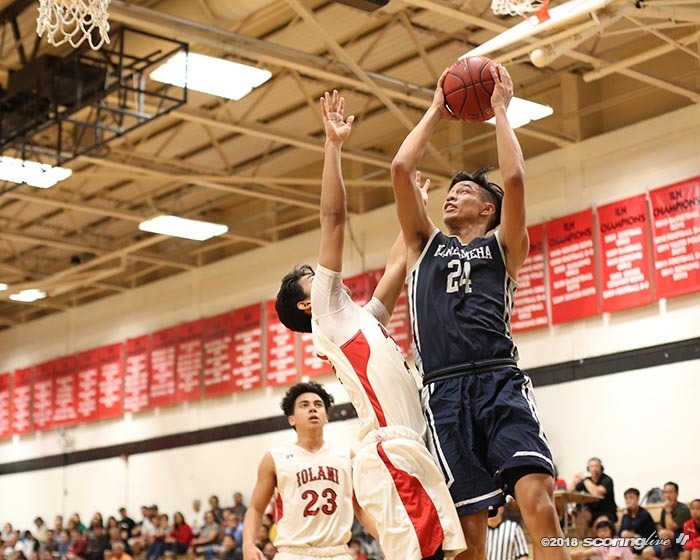 "They got into foul trouble in the first half which put us at the line and in the first half we shot a nice percentage from the free throw line and it helped us get back into it and helped create separation," said Tacon. 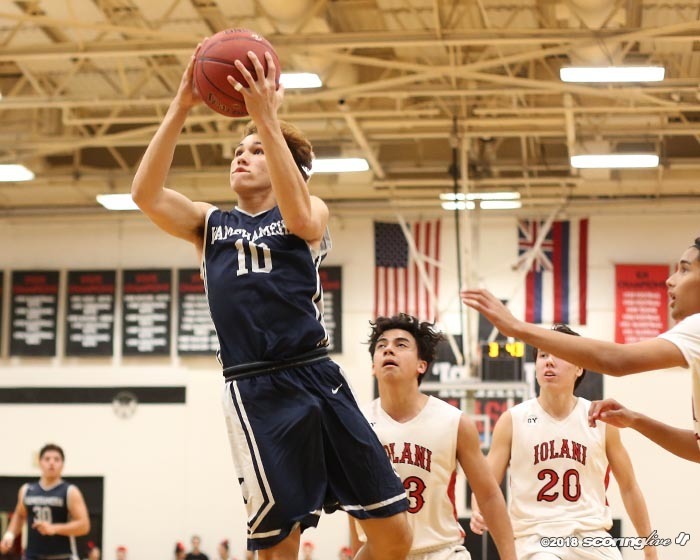 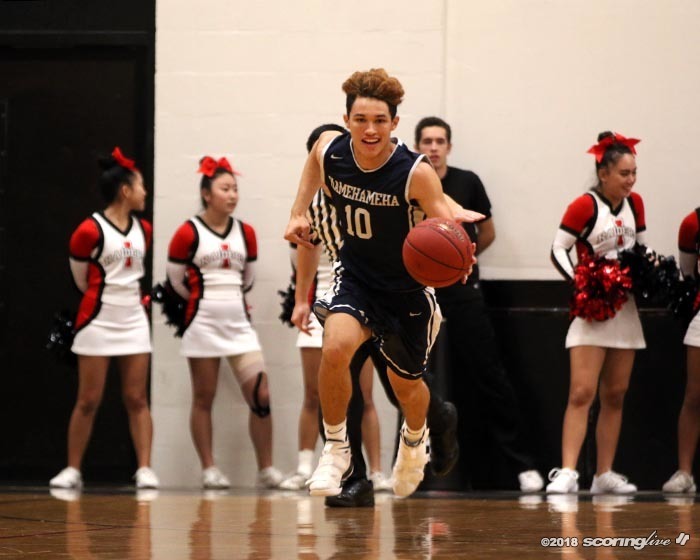 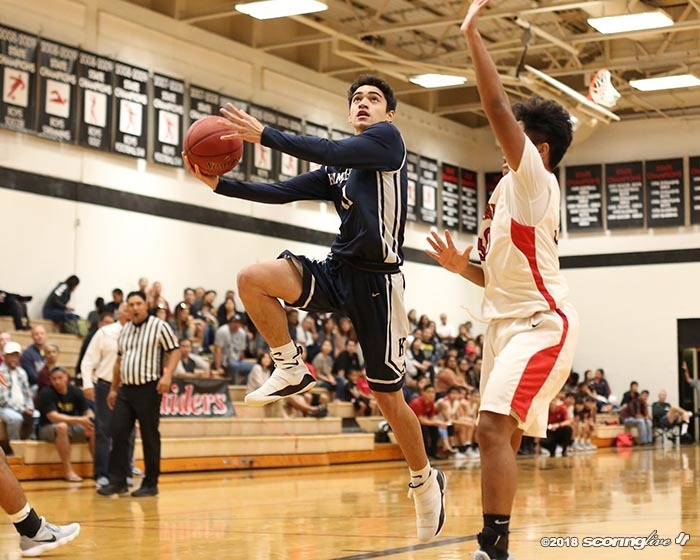 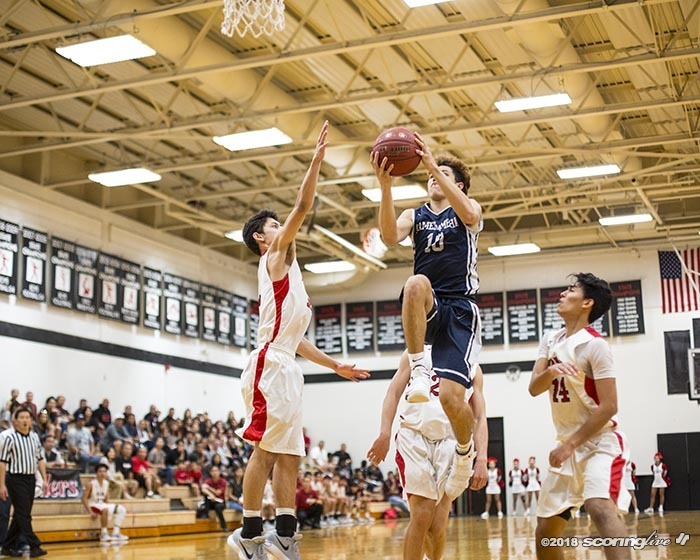 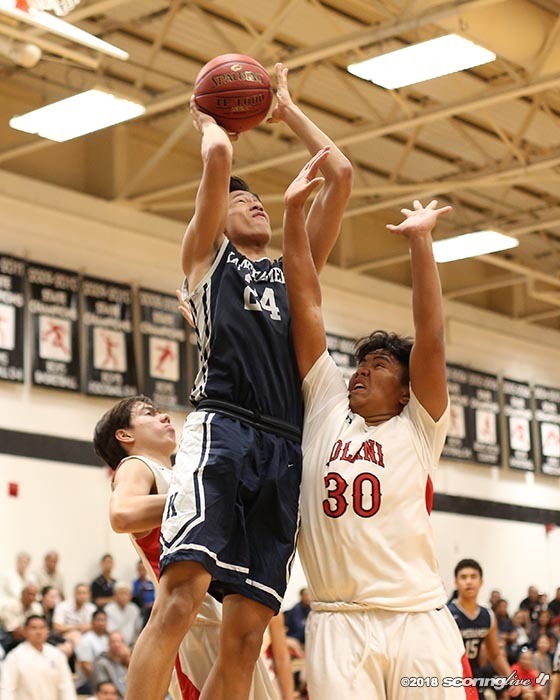 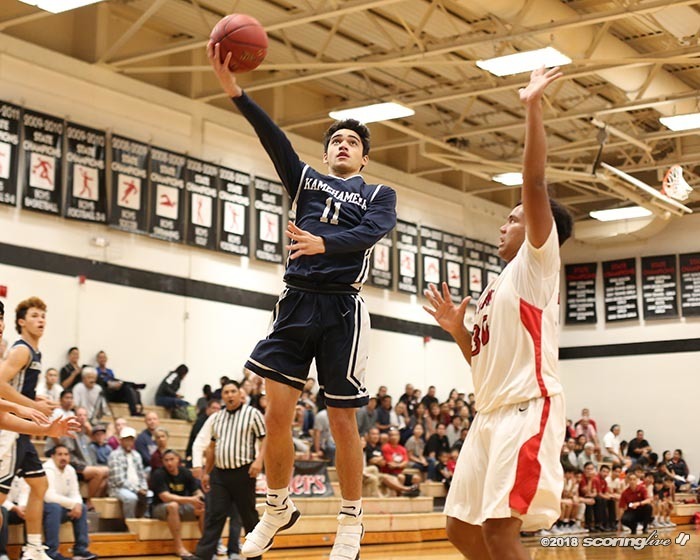 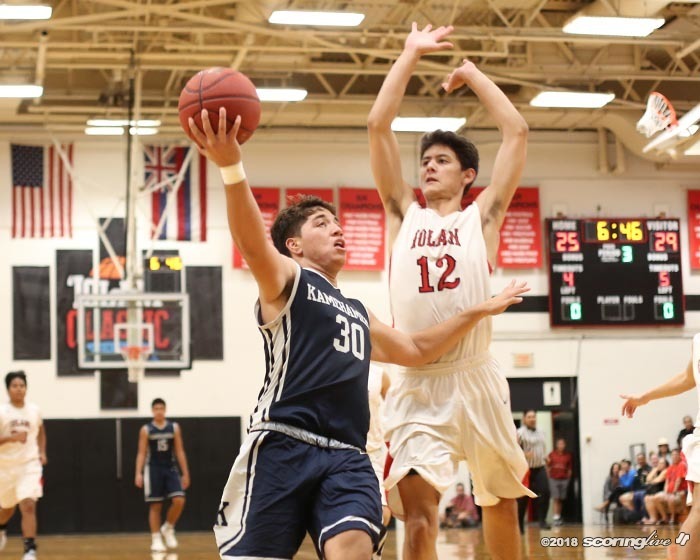 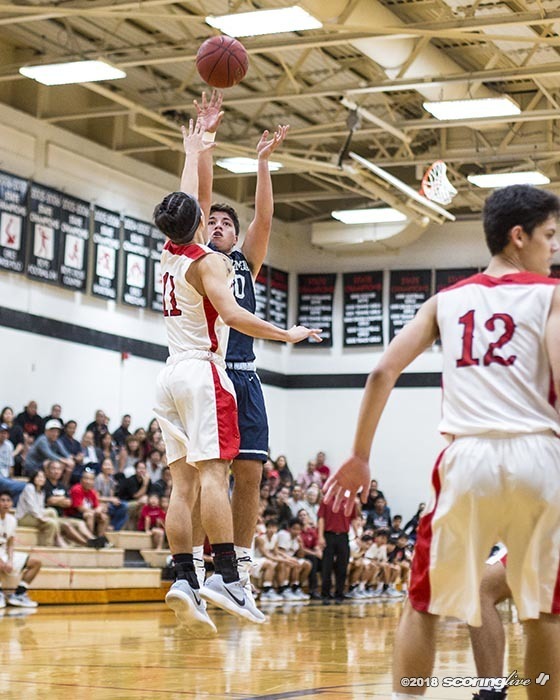 Young extended the Warriors lead to 10, 40-30 off his only 3-pointer of the game at the top of the arc and Kamehameha outscored Iolani, 16 to 10 in the third quarter. 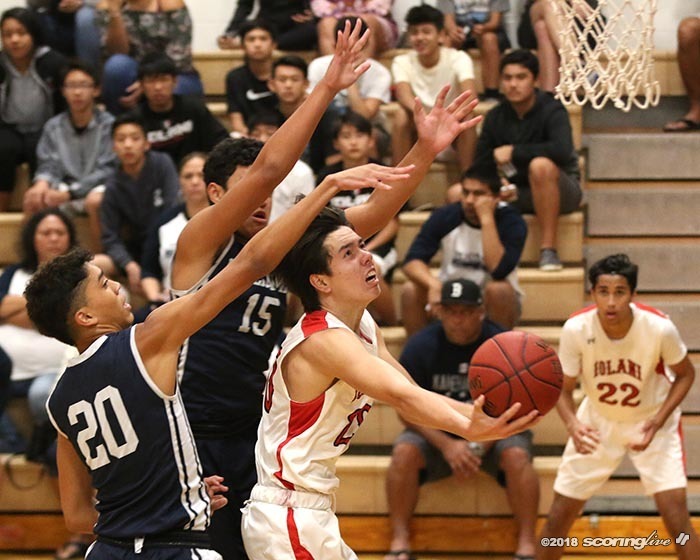 Iolani opened up the fourth quarter with a 5-0 run following Justin Genovia's 3-pointer and Frank Felix's baseline jumper, 45-40, but the Raiders could get no closer the rest of the way. 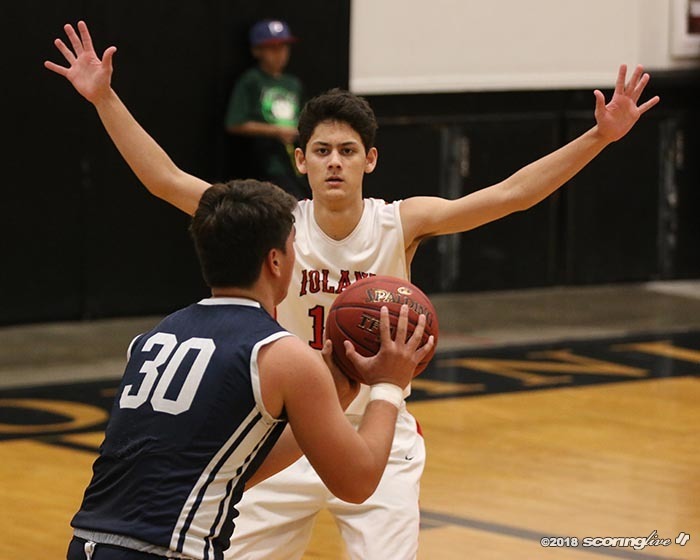 Justin Genovia led Iolani with 17 points on 5-of-11 shooting.